"Just keep swimming . . ." With these SWAP kits your scouts can make their very own miniature fish aquariums. These kits are perfect for aquarium, beach, pool, pet, oceans, lakes, rivers, Earth Day, campout, camporee, encampment, and much more! Your troop meeting or party could include making miniature fish aquariums for the girls to take home. You could also make these SWAPs ahead of time and share them with your scouts as a celebrate summer end-of-year gift. These finished fish aquariums are also perfect for hanging on the Christmas tree. They make beautiful ornaments. Gift them to your friends or family. Everyone loves a homemade gift! 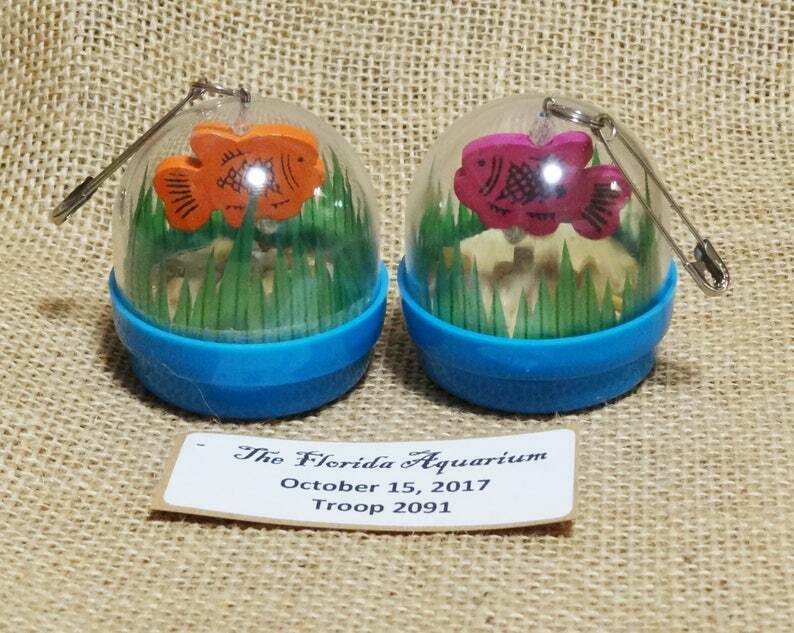 Each kit includes a globe, fish, water-scape, and pebbles, ad aquatic grass. The globe has a loop at the top for easy attachment of the split ring, safety pin, and personalized tag. The fish come in all the colors of the rainbow plus one more (red, orange, yellow, blue, green, purple, and pink). Each set of ten (10) will include an assortment of colors. JUST ADD GLUE. All SWAP kits include FREE personalized tags. Send us a message with your desired text, and we'll take care of the rest!